The pleasure of viewing and contemplating aquatic species has its roots in antiquity. The ancient Egyptians, Romans, and other peoples kept fish in artificial pools. The Chinese selectively bred goldfish from carp. Yet looking down on fish is very different from seeing them eye-to-eye. It was not until the technology of glassmaking advanced to the point where glass plate and large transparent vessels became relatively common products of industrial commerce that fishkeeping became both a popular hobby and, for some, a profession. With industrialization, increasing portions of the population, especially in larger cities, possessed enough leisure time to support the rise of the great natural history museums, zoos, and circuses of the mid-to-late nineteenth century. Those three kinds of institutions had very different missions, and the tension between their different ways of presenting animals remains evident in aquariums today. Natural history museums conduct scientific research, because classification of collections was their initial concern. Only secondarily were exhibits developed to educate the public. Circuses strive to entertain and astonish audiences—the more that animals could be trained to mimic human behaviors, the better. In their early years, zoos' focus on exhibiting captive animals by category left only rudimentary thought for animals' needs and the natural habitats from which they had been taken. 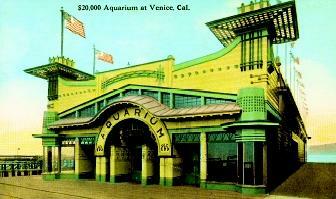 This postcard from 1909 depicts the aquarium in Venice, California. Originally built in that year for $20,000, the aquarium later became the marine biological station for the University of Southern California. As for the first aquatic gardens or aquariums, a few were constructed in basements of natural history museums, whereas some were more or less the extension of circuses. For instance, in New York and Boston, P. T. Barnum operated aquarium displays that included trained seals and beluga whales as well as fish in tanks. Other displays occupied a portion of municipal zoos, or were separately administered by the same city agencies. During both the Great Depression (1929–1939) and World War II (1939–1945), many urban areas, along with their zoos and aquariums, went into decline. The mid-twentieth century saw the rise of oceanographic parks emphasizing dolphins and sea lions trained through the behaviorist techniques then dominating psychology. Jacques Cousteau's television series gave the public an entirely new view of underwater life. In response to the public's heightened awareness and new expectations, aquarium managers began to respond with displays that, with increasing sophistication, replicated coral reefs and the habitats of fish and other aquatic animals. The New England Aquarium, completed in 1969 in Boston, Massachusetts, was the first aquarium constructed from the ground up to replicate natural habitats. An opportunity for children to touch living sea stars and other hardy local tide-pool invertebrates became a signature exhibit. Its near-immediate success as a tourist attraction helped reverse the decline of the city's waterfront, leading to similar efforts in other cities and the refurbishment of many established aquariums throughout the United States and abroad. Today's aquariums are in stark contrast to those of 50 years ago. Scientific research, stewardship, and education are key values supported by both large and small operations. 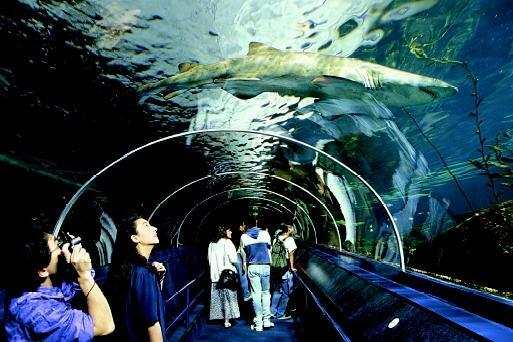 In New South Wales, Australia, visitors to Sydney Aquarium's open ocean display watch a shark swim overhead. Modern aquariums engage visitors through creative and interactive display designs not possible in early aquariums. research tends to focus on the holistic management of natural systems. Study and management of water quality is a priority for exhibition of species that both excrete and respire (breathe) in water. Recognition of the need to think systemically about human impacts on aquatic wildlife has led investigators to focus on protection of species that are vanishing from the wild due to overfishing and habitat loss. Captive breeding programs are now important to preserve endangered animals. Success reflects increasing skill at meeting the unique needs of diverse aquatic species. Vast though they seem, our waters are under relentless, if often unintentional, attack. Major threats include pesticide and fertilizer runoff from lawns and farms, pollutants generated by long-distance automotive commutes, idle littering of cigarette butts, escaped party balloons, spent fishing line, excess packaging, and other nearly indestructible plastic garbage, which is ingested by or entangles thousands of aquatic creatures each year. At many aquariums, conservation officers work to build stakeholder coalitions and prevent destruction of the world's natural heritage, only a small fragment of which can be represented in aquarium displays. Development of the public's sense of stewardship has become a priority as what was once deemed a curiosity—the ability to sustain a slice of ocean in a glass box—threatens to become a last sanctuary for aquatic species. Along with research and conservation, education is a third mission today's aquariums strongly support. Most aquariums have a sizable and well-trained corps of volunteer educators eager to interpret exhibits for visitors. Volunteer work is the leading path to careers in the aquarium field. In an effort to portray aspects of the aquatic world that do not lend themselves to tank displays, aquariums increasingly incorporate multimedia interactive exhibits, including some that do not require actual species on display. For example, Monterey Bay Aquarium (in Monterey Bay, California) and Mystic Marine Life Aquarium (in Mystic, Connecticut) are among aquariums featuring submersibles capable of transmitting data and video imagery from extreme depths. Interested people who call or write to aquarium personnel are likely to be showered with learning resources. Resources include videotapes, websites, and worksheets for preparing groups coming on school visits. Moreover, aquariums frequently offer curriculum and hands-on science materials through a library or teacher's center, similar to zoos and natural history museums. For a fee, many aquariums come out to schools with traveling exhibits and dramatic programs. Most aquariums can now be found on the Internet, with live cameras taking people on virtual tours, as well as interactive games and catalogs of gift shop and educational materials. Aquarium personnel frequently lead tours to local and exotic aquatic sites. Events of all kinds are hosted, including camps and overnight programs as well as weddings, corporate meetings, public forums, and other celebrations. Low-income communities often qualify for pass programs, grants, and scholarships. While most visitors come looking for large, fierce, or colorful species and visit during weekends and vacations when the atmosphere is at its most exciting, contemplative individuals choose quiet afternoons during the school year. Such moments can do much to deepen understandings of the aquatic world. SEE ALSO Aquaculture ; Bivalves ; Careers in Environmental Education ; Corals and Coral Reefs ; Cousteau, Jacques ; Crustaceans ; Endangered Species Act ; Fish ; Fishes, Cartilaginous ; Marine Mammals ; Pollution of the Ocean by Plastic and Trash ; Reptiles ; Submarines and Submersibles . Ryan, Gerald. Forgotten Aquariums of Boston. Boston, MA: New England Aquarium, 1997. Spotte, Stephen H. Fish and Invertebrate Culture. New York: John Wiley & Sons, 1970. Taylor, Leighton. Aquariums: Windows to Nature. New York: Prentice Hall, 1993.